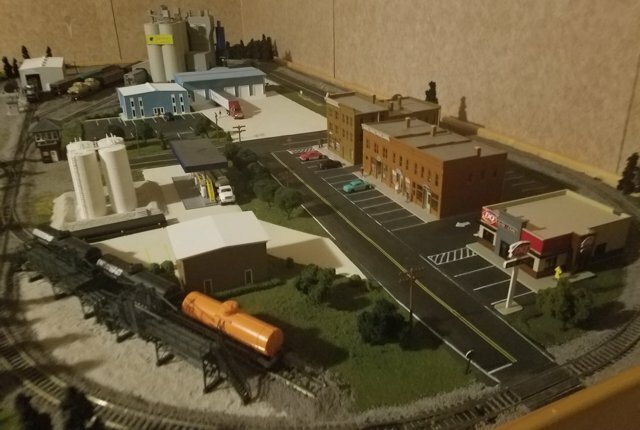 Nice 4x8 HO-scale train layout with single line in oval, passing around a small town and several industries. "My layout is a 4x8 and is in HO scale. It is set in the modern era. I know some of the cars are not exactly modern (still working on that). I used Bachmann E-Z track and running on DC. I hope you all like it." More info and pictures from this layout can be found in Dusty's topic My Second Attempt at my First Layout in Modelrailroadforums.com.